Walking through the big entrance arch of Dong Xuan Center is like entering another world. Suddenly, you seem to be somewhere far away from Berlin. Inside the six big halls, you find a market that could easily be located in an Asian country. As you browse through food and drinks, clothes and plastic kitsch, you will notice that the majority of sellers speaks Vietnamese. This is not incidental; what you are experiencing here is closely related to East German history. During the GDR, Vietnamese workers came to East Germany as part of a cooperation between the two socialist countries. After the fall of the wall, some stayed in their new home country. 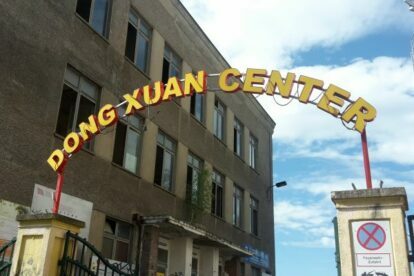 One of them, Nguyen van Hien, founded the center on the territory of a former GDR factory complex and named it after the famous Dong Xuan market in Hanoi. Today, the Dong Xuan Center is still an important location for the Vietnamese community. However, also many non-Vietnamese come here to shop, get a cheap haircut, a manicure or even a tattoo. For me, as a person with somewhat of a background in anthropology, a visit to the Dong Xuan Center is a bit like a cultural inquiry: I just love to look around and see how people interact, what they buy, how different cultures merge; until I eventually conclude my visit at one of the many bistros with a big plate of delicious Vietnamese food.